The snakeword is a simple but fun puzzle, particularly aimed at children. 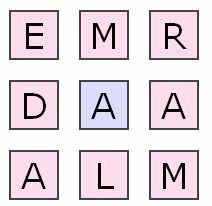 A nine letter word is hidden in a 3 x 3 grid in a number of different patterns. The word must be found by unravelling the chain of letters to find what the 'snake word' is. The first letter is placed at one of the corners or the centre, and from there you must move consecutively left or right, up or down one letter at a time to unravel the word. You cannot use the same letter twice, but rather must find the continuous chain of nine letters. We can supply snake word puzzles as PDF, EPS or image formats and with the colours of your choice or in black and white. Sample SnakeWord PDF.